The incumbent President had followed the constitutional provisions in dissolving the Parliament and fixing a date for the election, the AG maintained. The aforesaid provisions had been endorsed even after the introduction of the 19th Amendment to the Constitution. Article 62(2) of the Constitution empowered the President to dissolve Parliament. In the 1978 Constitution, the executive presidency was introduced instead of a ceremonial one. At present the executive presidency was in effect. The Attorney General had been made the respondent in the twelve fundamental rights violation petitions filed in the Supreme Court, challenging the recent dissolution of the parliament by the President. AG Jayasuriya, PC appeared with Additional Solicitor General Dappula de Livera, PC, Additional Solicitor General Indika Demuni de Silva, PC and Deputy Solicitor General Nerin Pulle. The Attorney General requested the Court to dismiss the petitions as baseless. Seventeen intervention petitions were filed. Some supported the petitions while the others, opposed the petitions and said that the President had the power to dissolve Parliament. Prof. G. L. Peris, the Chairman of the Sri Lanka Podu Jana Peramuna and Sanjeewa Jayawardena, PC filed two interventions which said that the President had the power to dissolve Parliament. Sanjeewa Jayawardena, PC and Manohara de Silva, PC both held the view that the President had the power to dissolve Parliament. 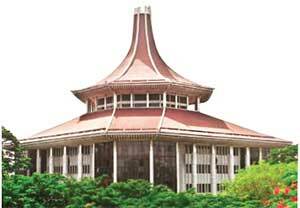 The bench comprised the Chief Justice Nalin Perera, Justice Priyantha Jayawardane and Justice Prasanna Jayawardena.